Imagine getting through your busy day without hands or legs. Picture your life without the ability to walk, care for your basic needs, or even embrace those you love. Meet Nicholas Vujicic. Without any medical explanation or warning, Nick was born in 1982 in Melbourne, Australia, without arms and legs. Three sonograms failed to reveal complications. And yet, the Vujicic family was destined to cope with both the challenge and blessing of raising a son who refused to allow his physical condition to limit his lifestyle. Sir you are the inspiration of million. I started to watch your videos last year (2015) . i follow your rules and regulation. After watching a lots of your videos . sir i am very inspired by you. You gave me a strength . and still you are giving …. Day before yesterday i got lots of happiness by you . sir you don’t know you have given me a lot . “sir you liked my tweet”. You liked my tweet sir that’s mean a lot. I am so blessed . Lots of changes come after this . i am totally changed . you gave me a lots of energy. You have given me a strength. your liked are like blessing for me. 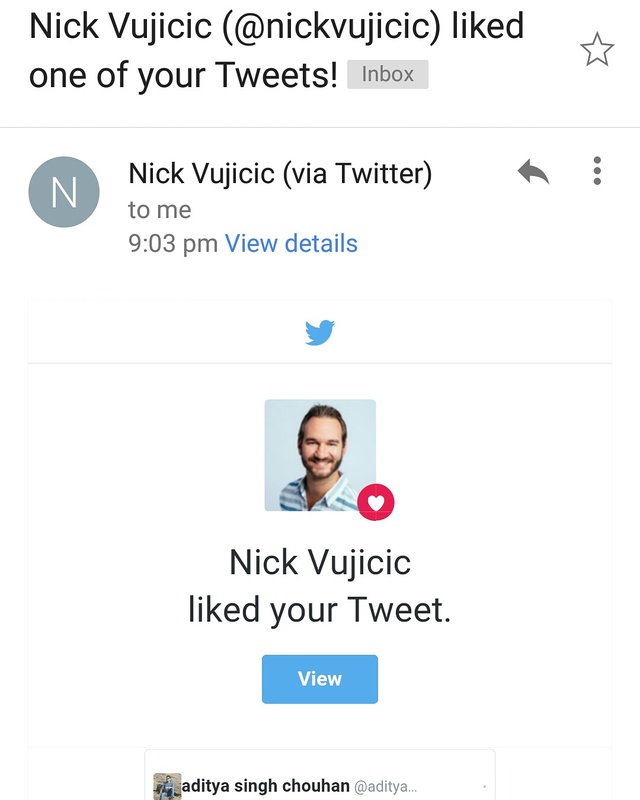 Thank you so much NICK VUJICIC . keep blessings. Seriously man! That moment when our idol makes us happy!! !